The name Hàng Sơn 1871 immediately evokes a bygone era. The year takes you back two centuries in the history of Hà Nội’s Old Quarter, to a time when everything but the street names was different. Even then, the city boasted tiny winding streets with the word “Hang”, meaning Craft, in the name. There are many of them: Hang Dao, or Silk Street; Hang Bac, or Silver Street, and even Hang Mam, or Fish Sauce Street. But Hang Son, or Lacquer Street, would become better known for a different product. The street is where the first cha ca (grilled fish), one of Hanoi’s signature dishes, was born in 1871. The name "Cha Ca" later replaced the name Hang Son and the street has carried it ever since. My high school friends and I decided to try this restaurant on a fine spring day to catch up and enjoy a meal. The restaurant façade looks just like any other townhouse city restaurant, except for the small alley next to the main entrance. As it turned out, the alley led to the backyard, which was spacious and a great place to have food on the terrace, under the shade of an old longan tree. 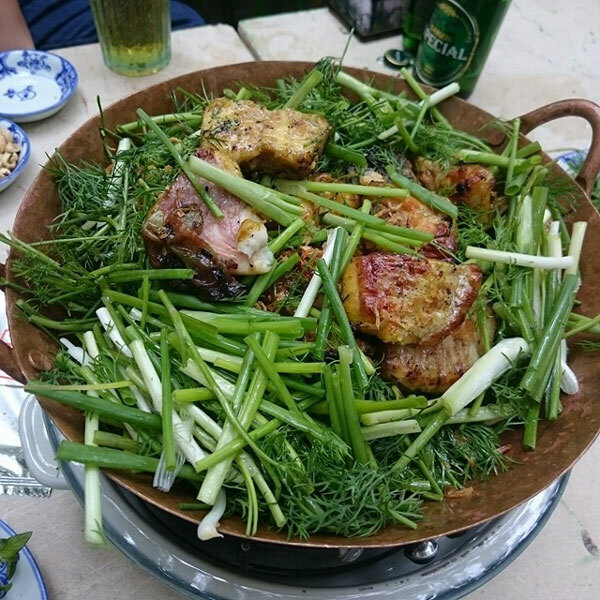 Needless to say, we ordered cha ca (VND135,000)—grilled fish cooked on the table with green onions and dill. Accompanying herbs include julienned white onions soaked in sugar and vinegar and Lang mint leaves. 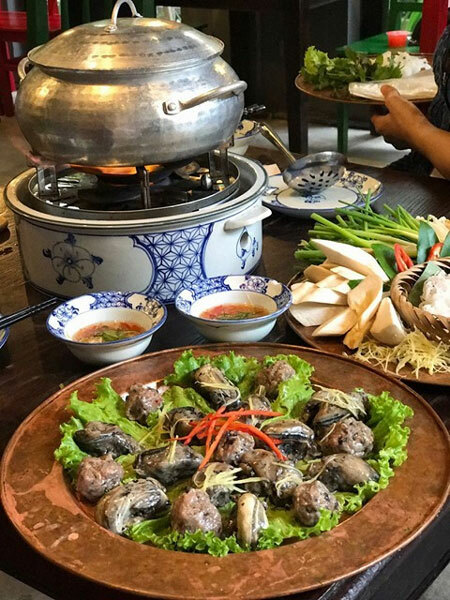 Over the past 10 years, the city’s food scene has boomed with all kinds of restaurants and food specialties from all the Vietnamese provinces and the world over. Cha ca has also enjoyed a great revival. 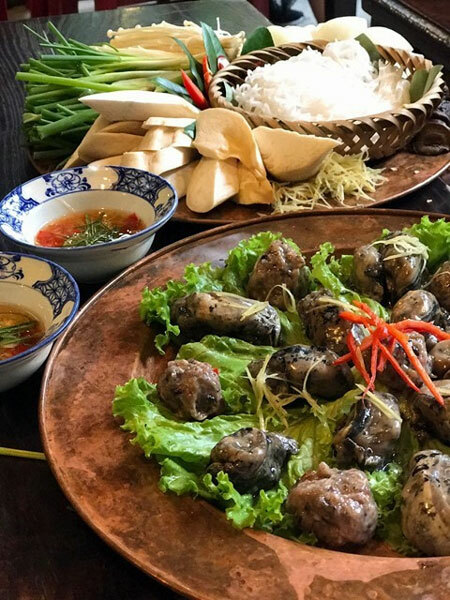 In addition to the original Cha ca La Vong restaurant on Cha Ca Street, Cha ca Kinh Ky and Cha Ca Thang Long arrived on the scene to mostly serve local diners as Cha ca La Vong became overcrowded. Some newcomers also offer cha ca at a very competitive price of VND120,000 per person. This is possible thanks to the new fish farms that raise the special lang catfish along the Da River and offer fish wholesale to the restaurants in Hanoi. We have had the grilled fish in all of the above-mentioned restaurants, and I must say, my experience at Hang Son was the best. The blue table ware recreated in the ancient style, the copper pan to stir-fry the dish above the flame and the perfectly marinated fish all combined for a fine dining experience. There are two seasons in which you can enjoy the best cha ca: spring and fall in Hanoi. Summer is too hot, while winter is too cold and even when cooked on the table, the fresh noodles will taste cold on your palate. But I must say that the other dishes at Hang Son that we tried during a couple of visits were all good. Hang Son offers delicious food in retro ambiance. Hang Son 1871 not only serves great food of the past. Its menu represents all the popular food of the three major regions of Vietnam. You can have nem lui, a Hue special wrap and roll dish (VND180,000), or hen xuc banh da, (VND95,000) stir-fried tiny mussels on rice crackers, also from Hue. We had a giant banh xeo (VND120,000), a southern delicacy, and assorted boiled vegetables and fruits dipped in caramelised fish sauce kho quet (VND95,000). One of our favourite dishes was Oc tha, floating escargot (VND380,000), Hanoi style. The pot can be shared among four people and is made in the old style. The taste was salty and spicy and reminds diners of the scents and tastes of the Red River rice fields. Fluffy, crispy escargots are ready made to be dropped into a boiling broth made from bone stock, lemon leaves and the pungent hot spice of sautéed chili. 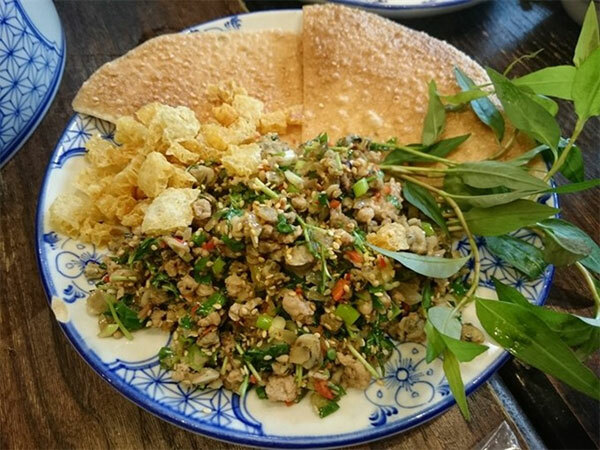 To enjoy this dish properly, when you order it, remember to ask for a jar of giam bong, or fermented whole grain rice—the manager said they do not add it into the stock. Just so you know, giam bong goes well with escargot in all soups that involve the ingredient. I miss the sweet memories of the old days, and shall soon carry myself back to them by calling on my friends to spend a meal at Hang Son 1871.